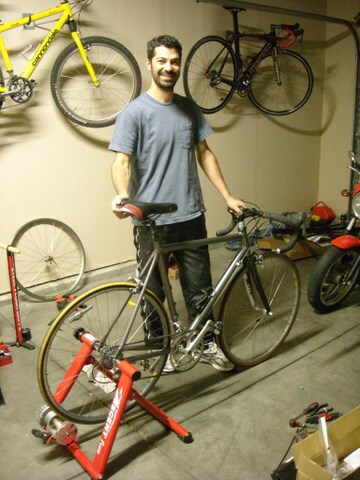 The other day I was over at the apartment of my friend Dave to inspect his faithful Performance carbon fiber bicycle. The bike consisted of a full monocoque frame that was bleeding edge for its vintage (1993) and durable Shimano Ultegra 8-speed components, but it was the former he was concerned about. A couple bike shops had recently told him that its woven black gold was now “shot,” so he wanted my engineering opinion. Alas, after looking it over, I concurred. The top tube’s base coat and clear coat had cracked like the grain of a wooden fence, and although I initially expressed optimism that it was just cosmetic paint damage, the carbon fiber did seem to be weaker in that area based on a hand-squeeze test. Carbon fiber technology in the 90’s wasn’t nearly as mature as it is today, and his bike had already exceeded the lifespan of a dog. It was time to retire the frame. The rest of the components were sound, however, and Dave wanted to shell out no more than, say, a Nook Color tablet’s worth of dough for a safe, functional road bike. Would it be best to buy a brand-new, lower-end racing style bike for $600 or so? No, I reasoned, he could get a quality aluminum frame and carbon fork; transplant the old components; and have a lighter, like-new bicycle for several Benjamin Franklins less than the budget options. Assuming our labor was free, of course. And for an “educational experience” and a good time among friends, it was. So the weekend after returning from the Furnace Creek 508, I met in the Garage Mahal with Dave who kindly brought over ingredients for a salad and pasta dish along with a variety of micro-brewed beers. We spent roughly seven hours transplanting and weighing his old components and also making some last-minute parts runs—e.g., for black cork handlebar tape, seatpost collar, derailleur cable, and front derailleur clamp. We were able to salvage almost all his old components and the only parts Dave had to purchase in advance were a new frame, fork, threadless headset and stem (his old fork was, of course, threaded). Total cost of all the new parts was $240, and it resulted in a bicycle that weighed only 0.3 pounds more than what his state-of-the-art, circa 1993, bicycle tipped the scale at. And it was a beaut. Below is a spreadsheet of the weights of his new and old bikes’ components. It estimates that his new steed weighs 19.8 pounds without pedals, which is exactly what my Cannondale 3.0 weighed before she went on a diet. Dave could easily trim some weight by getting a lighter saddle and tires if he so desired. I think he will be able to ride the bike for several more decades before its frame, like the old Performance carbon, finally becomes “shot” too. Here is a spreadsheet of the weight of Dave’s bike, along with components.